Is a family record book enough to travel with a baby or child ? For French citizens a family record book is not considered as official proof of identification. Children cannot therefore travel by air, even within France, using this document. Since the 26th of June 2012, all minor passengers must be in possession of a personal identity document (passport or national identity card according to the final destination) for travel to and within Europe. For trips requiring a passport it is necessary for minors to have their own individual passport. It is no longer possible for them to be included in the passport of a parent. Prior to departure, please remember to make sure you have all your child's documents required by police, customs and immigration of the destination country before the departure date. It is your responsibility to check the validity dates and allow for the time needed for these documents to be issued to you, which may be quite lengthy. How do I best prepare for travelling with my baby ? Please remember to bring the items you need for changing your infant, choose comfortable and warm clothing (sweaters and socks). It is also good to give your baby a bottle, or a lollipop during take-off and landing to reduce possible earaches. If your child is receiving medical treatment or suffers from travel sickness, please remember to bring his or her medical record and medications. Am I allowed to bring liquid food for my baby on the airplane ? Yes this is allowed. It is also advised to bring along baby bottles and food (including baby food in liquid form) with the appropriate quantity for the trip for your baby. Ensure also that your baby drinks plenty during the flight. If you would like that your child is served a special menu made up of baby food and biscuits, you can request a children's meal during your flight reservation up to at least 24 hours before departure. From what age may my baby travel ? Travel is not recommended for infants in the 7 days following birth. May I travel with a stroller ? Other foldable stroller: it replaces the hand baggage allowance for infants, and its dimensions cannot exceed: 55 cm x 35 cm x 25 cm / 21 in x 13 in x 9 in. You must pack the stroller in a carrying case that covers it fully. Please note : for security reasons, some airports may have to deny access to strollers inside the boarding areas. * On long-haul flights, except between metropolitan France and Cayenne, Fort-de-France, Havana, Mauritius, Pointe-à-Pitre, Punta Cana, Reunion, Saint-Martin and Santo Domingo and if there is sufficient space in the baggage hold. Avoid travel if your infant is ill.
Bring enough bottles and food for the trip. Please remember to bring the items you need for changing your infant (nappies, wipes, etc.). Make sure your infant drinks amply during the trip. Prior to departure, please remember to make sure you have all your child's documents required by the police, customs agents and immigration officers at your destination country. If you are bringing a stroller on board, please remember to affix a label displaying your contact information (name, address, phone number and e-mail). If your child is receiving medical treatment or suffers from travel sickness, please remember to bring his or her medical record and medications. Choose comfortable and warm clothing (sweaters and socks). During take-off and landing, give your child a sweet or chewing gum, or a soother, bottle, lollipop or cookie for infants, to reduce possible earaches. A baby is allowed travel under the definition of infant on Flybe services from the age of one week up to one year and 364 days. Accompanied by an adult and not occupying a seat, an infant is carried at 12% of the adult net fare. As it is a legal requirement for children over the age of two to travel in their own seat, passengers who are travelling with an infant who becomes two years old before their return flight must ensure that they have a seat reserved for the return flight. There is no additional charge for this seat. The infant fare will apply for the entire journey. Make your booking online as normal adding the infant to the whole itinerary. 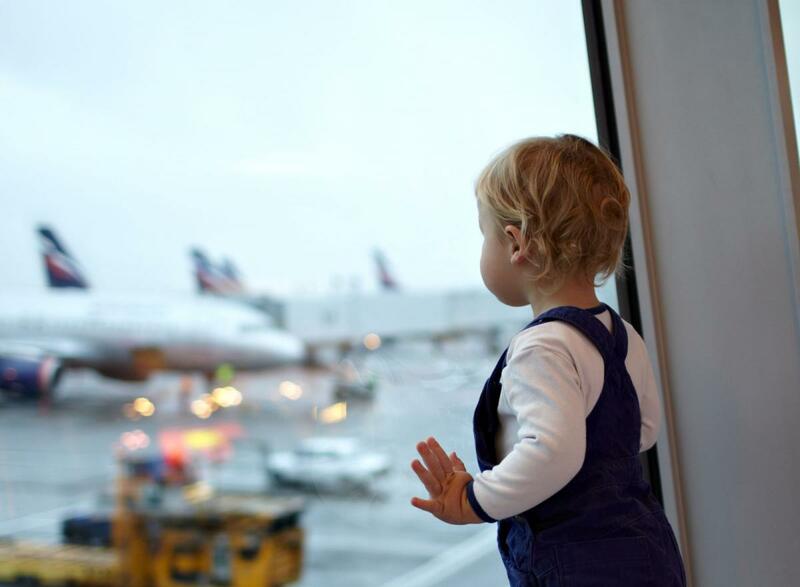 Once the booking is completed and you have a reference number, you will need to contact us to book a seat free of charge for the return flight where the infant is now travelling as a child of two years old. If for any reason there are no seats available on the flights you have chosen, we will assist you in choosing an alternative flight or offer a full refund. Please contact us on 0371 700 2000 (From the UK, calls to 03 numbers cost the same as calling 01 and 02 numbers and count towards inclusive allowances on land lines and mobiles. From abroad, calls to 03 numbers are charged at international rates) or +44 (0)1392 683152 if calling from abroad. Can I travel with my baby ? Babies from 7 days to 23 months of age can fly on their father or mother's lap. However, you may not board the cabin of the plane with car seats, strollers, or cots. 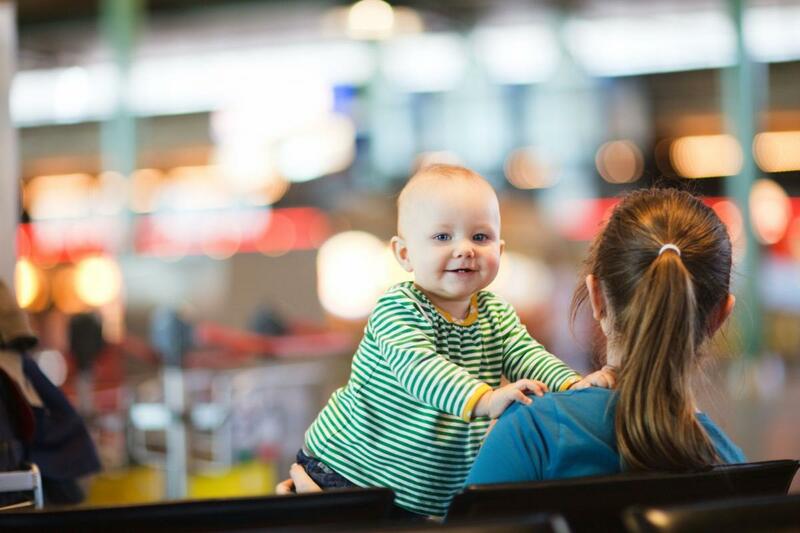 You can take a baby carriage up to the boarding gate, where our staff will take it and stow it in the baggage compartment. Once at your destination, your baby carriage will be delivered to you at baggage claim. We remind you that there is no charge for stowing baby carriages. For security reasons, babies under 7 days of age may not fly on board our flights. If babies do not have their own seat on the plane, they do not have the right to bring carry-on baggage. All passengers with seats have the right to one handbag up to 10 kg without charge. Babies should share baggage with the person responsible for bringing the baby with them. Babies must pay the single fee defined in the service fees table, in the Baby fare (under 2 years) section. Can I fly with a stroller ? Yes. You can bring the baby carriage (for babies) with you. 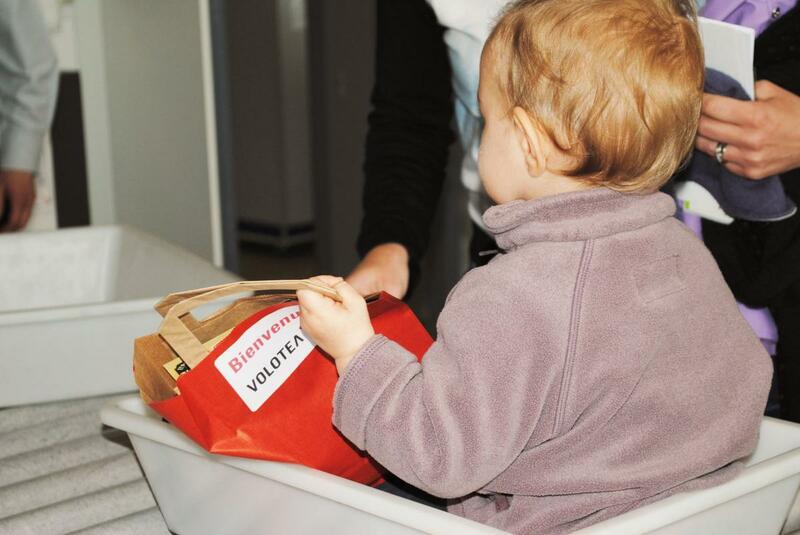 Volotea does not apply any additional charge for transporting a stroller. You can take a baby carriage up to the boarding gate, where Volotea staff will take it and stow it in the baggage compartment. Once at your destination, your baby carriage will be delivered to you at baggage reclaim. Do babies have the right to their own baggage ? If babies (under 2 years old) do not have their own seat on the plane, they do not have the right to bring carry-on baggage. All passengers with seats have the right to one handbag up to 10 kg without charge. Babies should share baggage with the person responsible for bringing the baby with them. YOU ARE WAITING ON A NEW ARRIVAL ? Being pregnant does not prevent you from travelling by air. Here is some advice to best prepare your trip. Do I need medical approval when travelling pregnant ? We recommend you seek your doctor's advice before travelling. Hop! advises not to travel beyond the 36th week of pregnancy. If you encounter any complications, you can travel up to the 34th week of pregnancy provided you have a medical certificate. Can I travel when pregnant with VOLOTEA ? Volotea will carry pregnant women until the 27th week of pregnancy (inclusive) without the need for them to bring a medical certificate. If travel takes place between the 28th and 35th weeks of pregnancy (inclusive), an original medical consent must be carried that confirms the woman's fitness to fly, states the period of validity of the document and includes the registration number and signature of the doctor. Women in their 36th week or more of pregnancy will not be permitted to fly. A medical certificate can be obtained from a local doctor's surgery or hospital. Simply bring it with you to the airport and present it at check-in to be able to board your flight. Furthermore, we do not recommend that either the mother or child travel within 7 days after childbirth. We would usually recommend at least 2 weeks to ensure there are no complications. Exceptions may be made to allow expectant mothers to travel from 34 weeks on routes operated by Loganair and Blue Islands only. Please contact specialassistance@flybe.com a minimum of 48 hours before you are due to fly in order to obtain authorisation to travel from the operating carrier. Travel may be refused if there is any concern over the passenger's condition. Avoid travel in the final month of pregnancy, as well as during the first 7 days after delivery.